A sundial is a special gift that lasts for all time. Fascinating and beautiful, sundials have been adorning cherished gardens since the Romans first perfected the horizontal dial two thousand years ago. Set on a plinth in a sunny spot, your sundial will create a focal point in your garden and is something you, your friends and family will enjoy for years to come. 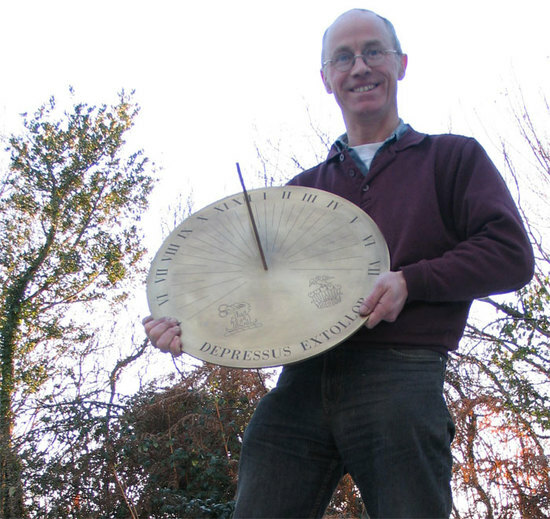 In a workshop nestled among the rolling hills of the Welsh border county of Monmouthshire, Capel Tenison makes personalised sundials to mark special occasions and celebrations for clients all over the world. Made from the highest quality marine grade brass, each dial is made individually to your instruction, hand engraved with your choice of words or dedication. And to make sure your dial tells the time with the greatest accuracy, the gnomon set for your exact location making your dial a time piece to rely on. A sundial is a gift that will capture fond memories of special days. Each dial is unique and made to your instructions. Ordering is easy, just choose a design, pen your words carefully and then let Capel create a sundial your garden will be proud of. We offer free standard delivery to UK mainland addresses for all sundials. Please make sure you fill out the order form we send you completely and accurately. We cannot refund or exchange dials we have made in line with your instructions, so please make sure you get the dedication wording right and check the spelling of any names and the dates!